OTTAWA — Craig Anderson made 33 saves in his first game since Dec. 5 to give the Ottawa Senators a 3-0 win against the New York Islanders at Canadian Tire Centre on Saturday. Anderson took personal leave while his wife, Nicholle, had treatment for throat cancer and returned Jan. 30. Mark Stone, with his Ottawa-leading 20th goal, Zack Smith and Jean-Gabriel Pageau scored for the Senators (29-18-6), who are second in the Atlantic Division and won back-to-back games. It was Anderson’s fourth shutout of the season and the second he’s had in his first game back after personal leave. 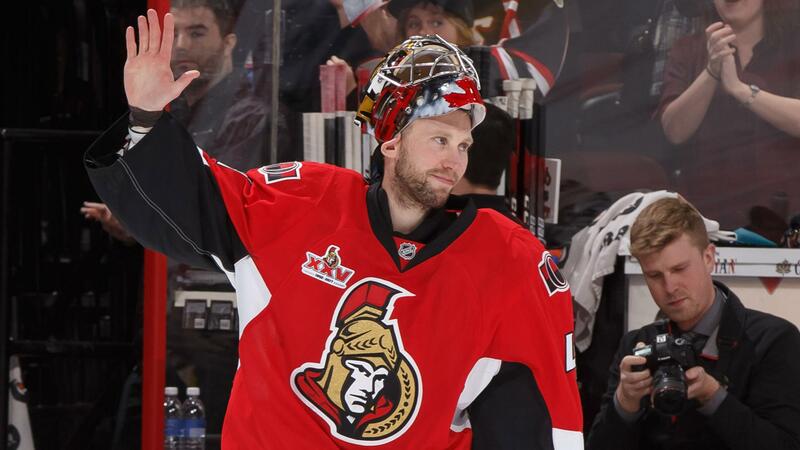 Anderson made 37 saves in a 2-0 win against the Edmonton Oilers on Oct. 30 after he left the Senators following the announcement that his wife had cancer. “Felt great. Got two points, got the win,” Anderson said. “I think it was an exciting day for myself to get back in the net and just be there for the guys, feel that camaraderie. Thomas Greiss made 21 saves for the Islanders (24-19-10), who lost in regulation for the second time in their past 12 games (8-2-2). The Islanders are 7-2-2 under coach Doug Weight, who replaced Jack Capuano on Jan. 17. “I think [Anderson] saw a lot,” Weight said. “He played well. We weren’t complete. We were missing a couple of pieces on a couple of lines. It wasn’t like we’ve been playing, a lot of confidence. We played hard, but we need everybody pulling the rope every game if we’re going to be successful in this league. It’s a tough place to play. They’ve been confident lately and playing well, and they got a little jolt getting Craig back. Stone put Ottawa ahead 1-0 at 4:10 of the first period. The Senators scored on two of their five shots in the second period, each on a 2-on-1. Smith made it 2-0 at 4:35 and Pageau converted Pyatt’s saucer pass at 7:12. Anderson made 14 saves in the second period, nine in the third. For the second game in a row, Stone scored from below the goal line. He chased down a missed shot behind the net and played a bank shot off Greiss. Stone scored on a wraparound against the Dallas Stars on Thursday. Josh Bailey had a good scoring chance on New York’s first shot of the game, 52 seconds into the first period, but couldn’t beat Anderson. It was the first shot Anderson faced since Dec. 5 and got him off to a good start. The tandem of Pageau and Pyatt finished killing a high-sticking penalty to Smith in the second period with some strong work along the boards in the Islanders zone, then scored three seconds after the penalty expired to make it 3-0. Stone scored 20 goals for the third straight season. … Pageau won 11 of 14 faceoffs, including seven of nine against Tavares. … For the second game in a row, the Senators used seven defensemen. … New York is 7-11-4 on the road and plays 19 of its final 29 games away from home. … The Islanders were shut out for the second time this season, the first was a 4-0 home loss to the Tampa Bay Lightning on Nov. 14.